The minivan's reputation as a safe ride may take a dent from the latest series of rigorous crash tests. The worst performers were the Nissan (NSANF) Quest, the Chrysler Town & Country and the Dodge Grand Caravan, according to the Insurance Institute for Highway Safety. 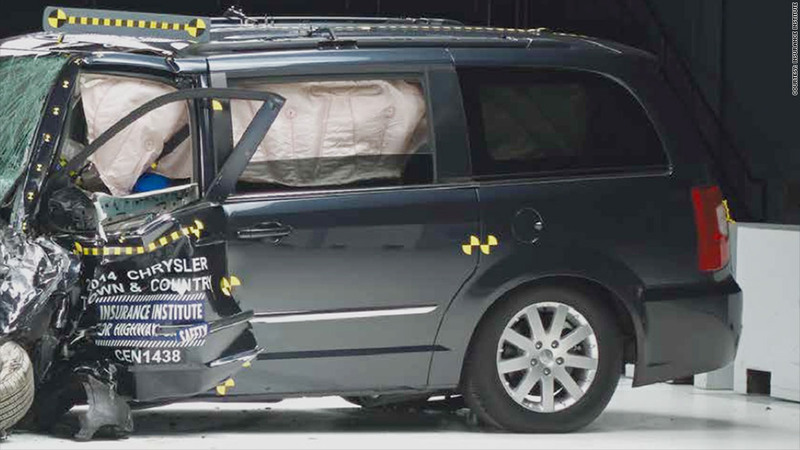 "Minivans are a popular choice among safety-conscious parents, but three of them fail spectacularly in the small overlap front crash test," read the new IIHS report. In that type of crash, the front corner of the vehicle takes the brunt of the impact, like in a collision with a tree or lamp post. That puts extra stress on the vehicle's shock-absorbing structure. The exception was the Toyota Sienna, which earned an "acceptable" safety rating from IIHS. The Honda Odyssey performed well last year but was not tested this year. But the others just didn't hold up. Part of the Quest had a dent that was two feet deep. "The dummy's left leg was trapped between the seat and the instrument panel, and its right foot was caught between the brake pedal and toe pan," IIHS said. "(T)echnicians had to cut the entire seat out and then use a crowbar to free the right foot," the Institute added. "A real person experiencing this would be lucky to ever walk normally again." Nissan spokesman Steve Yaeger said his company "will continue to review these and other results from IIHS testing as we seek opportunities for improvements." Consumer Reports responded to the test by suspending its recommendation of the Quest. 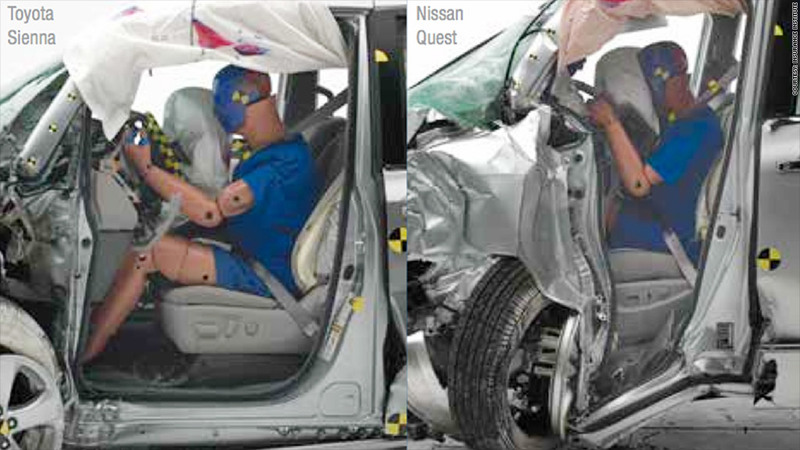 IIHS tested several minivan models, and said several "fail spectacularly in the small overlap front crash test." The Town & Country's structure "collapsed around the dummy," and the airbags did not sufficiently protect the driver, IIHS said. The vehicle is also sold under the Dodge brand as the Grand Caravan. Chrysler responded that vehicle safety should be viewed through the results of multiple tests. "Chrysler Group minivans meet or exceed all government-mandated safety requirements," the company said. "They are unchanged, structurally, from previous model-year vehicles that received the highest performance ratings bestowed by the IIHS in tests simulating the four main crash types."